One of these things is not like the other. When was the last time a zombie flick, let alone one toplining Arnold Schwarzenegger, appeared at a film festival as prestigious as Tribeca? Answer: never. We might expect to find it at Comic Con, Wondercon or even SXSW, but not in the sophisticated concrete canyons of New York City at a fest that, in its 14th year, would like to be more readily likened to a Toronto South or a North American Cannes. Sandwiched somewhere in between the 40th Anniversary screening of Monty Python & the Holy Grail, and the 25th Anniversary of Goodfellas (starring Tribeca founder Robert DeNiro), first time director Henry Hobson will bring his father/zombie daughter tale, Maggie, starring ‘The Governator’ himself, alongside Abigail Breslin (who’s already appeared in another well-received genre flick, 2009’s Zombieland). Hobson apparently earned his chops designing the title sequences for six episodes of “The Walking Dead”. (I’m not kidding.) He’ll enter the dramatic narrative competition alongside 1st time director John Maclean’s Slow West and Tim Blake Nelson’s Anesthesia (with Sam Waterston, Glenn Close & Corey Stoll), to name but two. So, how did this happen, you might well ask. The script landed on the 2011 Black List and when it was optioned, was originally slated to star Chloe Grace Moretz (the other preternaturally-gifted teen actress) and Paddy Considine. Finally filmed in 2013, this incarnation was to bow at the Toronto International Film Festival last September, but was pulled by Lionsgate when they picked it up for distribution. Huh? I don’t pretend to understand the wily ways and squirrelly logic of Lionsgate’s execs, but Maggie, judging from the accounts that I’ve read and this first trailer, might actually be good. 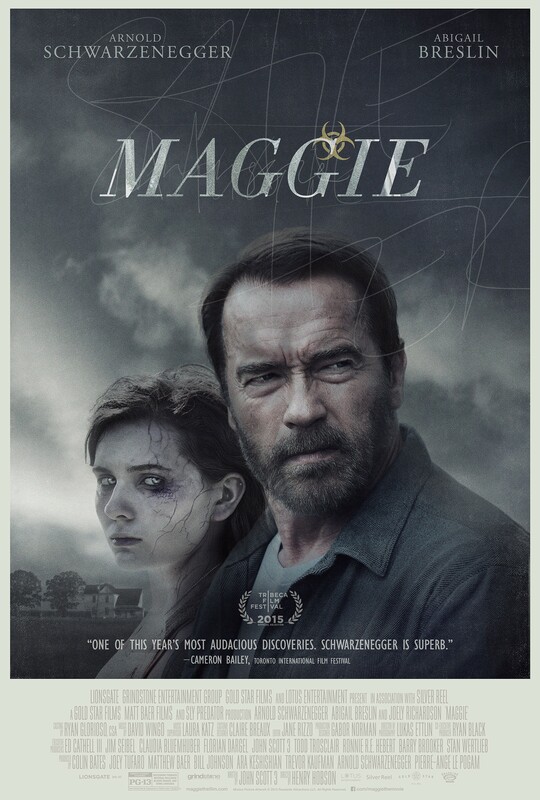 The film’s trailer shows Arnold Schwarzenegger’s character Wade, who has made a promise to his wife (the ever fabulous Joely Richardson) to take care of their daughter Maggie (Breslin), faced with a dilemma when the latter becomes infected with a zombie virus.Wade must grapple with whether he can “cure her”, to “save her”, before he has to “kill her”. Whether it is or it is not “beautiful”, the tone of the trailer, the score and even the gravitas in that poster, would suggest the filmmakers certainly think so and it does appear that this isn’t the usual zombie film filled with slow-moving undead hungry for BRAAAAAINZ!, but one that puts a spin on the genre by following the story of a father’s struggle to protect his daughter. Written by another first-timer, John Scott 3, Maggie, made for a mere $8 million, also stars (no one else you’ve probably ever heard of) Laura Cayouette – Leo’s sister in Django Unchained, the hypnotized woman with the philandering husband in Now You See Me; Denise Williamson – 3 episode arc on “Friday Night Lights” as Maura; Raeden Greer – Pauline LaLaurie in “American Horror Story: Coven”; and J.D. Evermore – Sheriff Carl Daggett, “Rectify”. It is set to hit (a limited number of) theaters (and VOD) in the US on May 8.